Slow Roasted Lamb Shanks are my favourite food for a winters day. When you’ve been outside working and really want some comfort food with a big bowl of mashed potatoes and a glass of red wine. The shank has become very popular, unfortunately, as the prices have started to creep up. About 3 years ago I could buy them for 50cent each. Now they are a bit more expensive. But still as tasty. The shank comes from below the knee on the animal. The flavour comes from the bone aswell as the meat and needs to be very slow cooked. 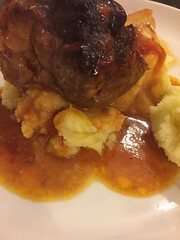 As an aside, one of my favourite Italian dishes is Ossobuco alla milanese, which is an Italian veal shank dish. Something I’m dying to make myself. But veal shanks are next to near impossible to get. Re the wine- I don’t profess to be an expert. And really rely on opinions of others (@Colmmccan, or @WorldWideWines) but in this case, the Greywacke Pinot Noir 2014 is a match made in heaven. Incidently the wine I use in the cooking of the dish is a white wine. 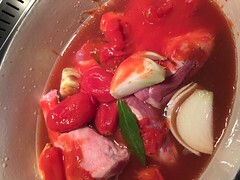 Traditionally red wine is used for slow braising, but in this case, the shank is quite a delicate flavour and you want the flavour of the lamb to shine, not the accompaniments. Save it for drinking with the meal. 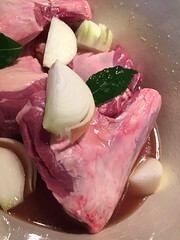 Place the shanks in a large casserole pot. Make small cuts on the meat and push in some pinches of rosemary. Add the carrot, and onion, a few whole peppercorns, the herbs and two to three lightly smashed whole cloves of garlic. Pour over enough wine to cover the meat of the shanks – this is about a whole bottle and then leave overnight if you wish. The next day, place the pot, covered with tinfoil and a tight fitting lid in a preheated hot oven at 1500C and cook for about two hours or more. If the simmering becomes too lively during cooking, reduce the temperature slightly. Slightly uncover the pot for the last hour so that the liquid will start to reduce. Best served with some green veg and literally tonnes of mashed potato. Tonnes. Divine.